England's Michael Lumb, who has played seven Twenty20 internationals, will help Queensland's push for a berth in the Champions League after agreeing to join them for this summer's Big Bash. Lumb, a left-handed opener, was part of the World Twenty20 victory in the Caribbean in May and will aim to provide the Bulls with some much needed power hitting. "When we learned that Andrew Flintoff was not going to be able to take up his contract with us, we looked at a few players that we felt would bring something special to our group,'' the Queensland coach Trevor Barsby said. "Having caught a few of his performances for England and Rajasthan Royals, Michael was pretty well at the top of the list as far as I was concerned." Lumb, 30, has a strike-rate of more than 140 in both international and domestic T20 competition, and will be released by the state if he is called into England's plans. 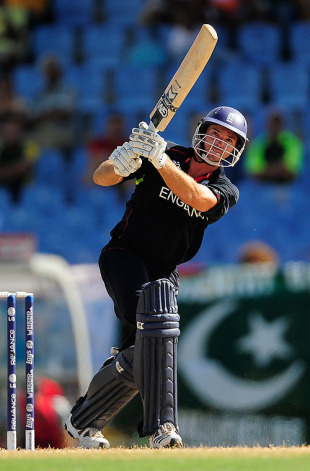 "It's going to be an amazing experience playing in Australia - I honestly can't wait,'' Lumb said. "I've come across lads like Ryan Harris and Andrew Symonds in the IPL and have had a good chat with Trevor Barsby, so the tournament can't come soon enough." He is the second English player to join the event, which starts in late December, after Sajid Mahmood was picked up by Western Australia on Tuesday.